Water conservation is a way of life, one that does not require a major change in lifestyle. Mostly, it’s a matter of using common sense. Fresh, clean drinking water is yours to use when needed, but remember that it is a valuable resource that should not be wasted. A little effort will make a big difference. Water can be saved throughout the house by changing both plumbing fixtures and personal habits. You can lower your water bill and help conserve your community’s most precious natural resource. Every drop counts! 1. Repair dripping faucets quickly. If your faucet is dripping at a rate of one drop per second, you can expect to waste 2,700 gallons per year. This adds to the cost of water and sewer utilities, or can strain your septic system. 2. Do not let the faucet run while washing hands, face, or shaving. When shaving, fill the bottom of the sink with enough water to rinse the razor rather than letting the water run. An electric razor saves a great deal of water. 3. Turn the water off while brushing your teeth. If everyone in your family leaves the water on while brushing their teeth, as much as 600 gallons can be wasted each month (assuming a household of 4 people, brushing for 1 minute twice a day, with a 2.5 gpm faucet). 4. Install faucet aerators, which reduce wastewater by mixing water and air. 5. Do not use the toilet as a wastebasket. Each flush of a standard toilet uses 3 .5 to 7 gallons. 6. Place an item such as a plastic bottle filled with water inside your toilet tank. This acts to displace water and can save gallons each day. Caution: Keep the bottle away from the operating mechanisms and don’t use brick – it will decompose and ruin the operating mechanisms. Be sure not to displace too much water causing a need to double-flush. Double flushing will waste more than is saved. 8. Replace or adjust a toilet handle that sticks and lets water run constantly. 10. Replace your toilet flapper on a regular basis, as this component is the most likely to leak. Reminder: If you have a low flow toilet you may need to purchase a special flapper to keep your conservation benefit! 11. Toilets generally account for 30% of your indoor water use. Replacing an inefficient model can save the average family of 4 over 20,000 gallons of water per year. 12. Replace your showerhead with an ultra-low-flow version. Some units are available that allow you to cut off the flow without adjusting the water temperature knobs. 14. Turn the water off while shaving or lathering; turn it back on to rinse. A shower on/off switch may be purchased at hardware stores for less than $10. This keeps the water temperature the same during a brief shut-off. 15. Insulate pipes to get hot water faster, so less water is wasted. 16. Install water saving flow restrictors. 17. Collect shower/bath “warm-up” water in a bucket for use in watering plants or flushing a toilet. 18. Planning a renovation or new bathroom? Consider water recirculation in your sink and shower plumbing. Water won’t come out of the fixture until it’s warm, eliminating “warm-up” waste entirely. A recirculating pump is also available from local plumbing fixture stores for retrofitting existing plumbing. The cost for this pump is approximately $400. Another option is drain water heat recovery. This option can cost $300-$500 and is detailed on this page from the Department of Energy. 20. Keep a container of water in the refrigerator rather than letting water run to obtain a cold drink. 21. Designate one glass for your drinking water each day. Or, carry a reusable water bottle. This will cut down on the number of times you run your dishwasher. 22. While most conventional dishwashers use anywhere between 7 to 14 gallons per load (gpl), a water-efficient dishwasher only uses 4.5 to 7 gpl. Visit the EPA’s Energy Star page to find out if you qualify for a federal or manufacturer’s rebate on a new dishwasher. 23. Fill the dishwasher before turning it on. Washing a partial load of dishes uses the same amount of water as a full load. 24. Do not rinse dishes prior to putting them into an automatic dishwasher. Instead, wipe them with paper napkins from the meal or use a partially filled sink to do any necessary pre-washing. 25. If you must rinse, use the sprayer. 26. Soak heavily soiled dishes and pans in soapy sink water instead of scraping under running water. 27. If washing dishes by hand, rinse them in a half-full basin or pan instead of under running water. 28. Before draining your dishwater, use it to rinse out recyclable glass, cans or plastic containers. 29. Turn on the garbage disposal when pulling the plug on dirty dishwater. This allows the disposal to be cleaned out without using more water from the faucet. 30. Dispose of paper and excess food in the garbage rather than the garbage disposal. Garbage disposals can add 50 percent to the volume of solids in a septic tank, which can lead to malfunctions and maintenance problems. 31. Consider composting rather than using the garbage disposal. It’s also great for your garden! 32. To clean vegetables, use the sink or a bowl to retain water. Scrub with a vegetable brush and turn on water only for a quick rinse. 33. Thaw frozen foods in advance in the refrigerator or use the microwave instead of running water. 34. Take ice cube trays from the freezer a few minutes before they are needed. The ice cubes will loosen at room temperature without the need to run them under tap water. 35. Washers purchased before 1999 use 4 times the energy of a newer model and waste 30 gallons of water per load. Is it time for your washer to be replaced? Look for the most water efficient model that fits your needs and your budget. And remember that due to long-term utility bill savings, a more expensive model may pay for itself in 5 years. Visit the EPA’s Energy Star page to find out if you qualify for a federal or manufacturer’s rebate on a new washer and how to recycle your old one. 36. Fill the washing machine with a full load of laundry. 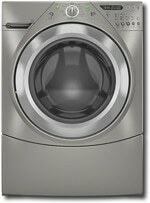 If your machine has a water level selector, make sure it is always set to match the amount of laundry being washed. 37. If rinse water from the washer empties into a basin, collect the water for use in other cleaning projects. 38. Avoid purchasing recreational water toys that require a constant stream of water. 39. If you have a swimming pool, consider a new water-saving pool filter. A single back flushing with a traditional filter uses 180 to 250 gallons of water. 40. In the summertime, an uncovered pool loses about an inch of water per week. Covering your pool when not in use can reduce that by 90%. A pool cover also provides added safety. 41. Do not hose down your driveway or sidewalk. Use a broom to clean leaves and other debris from these areas. If your business requires a deeper cleaning, consider a high pressure waterbroom that may use only 2.5 gallons per minute. 42. Avoid the installation of ornamental water features (such as fountains) unless the water is recycled. 43. Use a shut-off nozzle on your hose, which can be adjusted down to a fine spray so that water flows only as needed. When finished, turn it off at the faucet instead of at the nozzle to avoid leaks. 44. Check hose connectors to make sure plastic or rubber washers are in place. Washers prevent leaks. 45. If you must water lawns, do so at night or in the early morning. The plants absorb the water more efficiently when heat from the sun is at its weakest. More water evaporates during hot daytime hours. 46. Don’t over water your landscaping. Wilting can be a sign of excess water. As a general rule, lawns only need one inch of water per week, less in the winter. Use a rain gauge to determine how much water your yard receives each week from rain and irrigation. 47. Don’t allow sprinklers to water your street, driveway or sidewalk. Position them so water lands on the lawn and shrubs… not the paved areas. 48. Install irrigation devices that are the most water efficient for each use. Soaker hoses and micro or drip irrigation are examples. 49. Check sprinkler systems and timing devices regularly to be sure they operate properly. 50. Do not leave sprinklers or hoses unattended. A garden hose can pour out 600 gallons or more in only a few hours. Use a kitchen timer to remind yourself to turn off sprinklers. 51. Raise the lawn mower blade to at least three inches or to its highest level. A higher cut encourages grass roots to grow deeper, shades the root system and holds soil moisture better than a closely clipped lawn. 52. Regularly aerate your lawn and remove thatch to allow water to penetrate the soil surface. 53. Avoid over fertilizing your lawn. Fertilizer applications increase the need for water. Apply fertilizers that contain slow-release, water-insoluble forms of nitrogen. 55. Group plants together based on similar water needs. This will reduce over-watering of the plants that don’t need as much. 56. Plant native and/or drought-tolerant grasses, ground covers, shrubs and trees. Once established, these plants will require less water, fertilizer and maintenance than a typical lawn. They’re more likely to survive a dry period too. For more information, visit the Virginia Cooperative Extension website and type “water-wise” into the search box. 57. Use mulch to retain moisture in the soil. Mulch also helps control weeds that compete with landscape plants for water. 58. Use a bucket to wash your car instead of a hose, or consider using a commercial car wash that recycles water. 59. 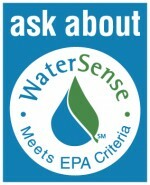 Look for the WaterSense label when purchasing fixtures and appliances or hiring an irrigation professional. Products that earn the label have met EPA standards of at least 20% greater water efficiency while maintaining comparable performance to similar items. 60. Verify that your home is leak free. Many homes have hidden water leaks. Read your water meter before and after a two-hour period when no water is being used. If the meter does not read exactly the same, there is a leak. Want to narrow it down further? Close the main water shut-off valve in your home; if the meter is still turning, the leak is between your meter and the shut-off valve; if it stops, the leak is somewhere in your home. This page from the EPA has many leak detection instructions. 61. Pay attention to your water bill. Does your usage spike during certain times of the year, like the summer? If so, consider implementing more of the Outdoor Tips. Is your overall usage increasing over time? That could indicate a leak. 62. Repair all leaks as soon as possible; a little drip can waste a lot of water. Many leaks are simple fixes. 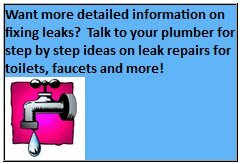 Instructions can be found on many websites, or by checking out a home plumbing guide. 63. Perform a home water audit and learn where your household is using the most water. 64. If you have a well at home, check your pump periodically. Listen to hear if the pump kicks on and off while water is not being used. If it does, you have a leak. 65. 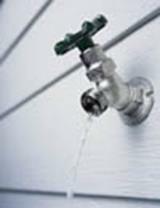 Make sure you know where your water shut-off valve is located. This could save gallons of water and damage to your home if a pipe were to burst. 66. Report all significant water losses (broken pipes, open hydrants, errant sprinklers, abandoned free-flowing wells, etc.) to the property owner, local authorities or your water agency. 67. Install water-softening systems only when necessary. Save water and salt by running the minimum amount of regenerations necessary to maintain water softness. Turn softeners off while on vacation. 68. A water-to-air heat pump or air-conditioning system uses a great deal of water. Newer air-to-air models are just as efficient and do not waste water. 69. Use water from dehumidifiers to water indoor and outdoor plants. 70. Collect condensate water from air conditioning units to use for watering plants. 71. Don’t waste water just because someone else is footing the bill, such as when you are staying at a hotel. Every community benefits from conservation efforts. 72. Never pour water down the drain when there may be another use for it. 73. Encourage your friends and neighbors to be part of a water-conscious community. 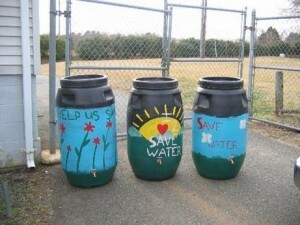 Promote water conservation in community newsletters, on bulletin boards and by example. 74. Encourage your employer to promote water conservation in the workplace. Suggest that water conservation be put in employee orientation and training programs. 75. Patronize businesses that practice and promote water conservation, such as restaurants that only serve water upon request and certified carwashes. 76. If you own a business, incorporate the water conservation suggestions from the EPA. 77. Be aware of and follow all water conservation and water shortage rules in effect in your community. Don’t assume — even if you get your water from a private well — that you need not observe good water use rules. Reservoirs, both above and below ground, are interconnected. Every drop counts. 78. Encourage your school system and local government to help develop and promote a water conservation ethic among children and adults. 79. Support projects that will lead to an increased use of reclaimed wastewater for irrigation and other uses. 80. Support efforts and programs that create a concern for water conservation among tourists and visitors to our state. Make sure your visitors understand the need for, and benefits of, water conservation. 81. Get involved in water management issues. Voice your questions and concerns at public meetings conducted by your local government or retail water provider. Every drop counts. You can make a difference.